Over 100 participants shared hundreds of their thoughts, ideas and tips during last last Friday’s #HITsm tweet chat on “Maximizing your #HIMSS17 Experience – Whether Attending Physically or Virtually.” You know it’s a popular chat when the hashtag starts trending and the spammers hijack the hashtag. This post will be the first of what I expect to be a handful of posts sharing curated insight from tweets shared by 57 of the #HITsm chat participants. If you have any additional thoughts, ideas and tips for maximizing the benefit of the yearly HIMSS Conference & Exhibition, please share there in the comments below or out on Twitter. 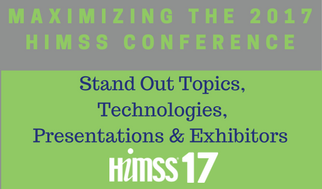 Topic #1: What do you think will be ‘stand out’ topic(s,) technologies, presentations & exhibitors at #HIMSS17 and why? What will be the walk away "Buzzword" of #HIMSS17??? Is it really just about the technology? Health IT woes have been more about culture than the tools. I'm guessing #MachineLearning and #HealthPolicy will be 2 hot topics at #HIMSS17. Gotcha. I think VR will have another coming our party in 3-5 years. AI will be big this year! VR with adv radiology will cause a major turf war between rad's and surgeons. Agree! Hope there are more #CyberSecurity solutions for providers than last year! I think blockchain will piggy back cyber. Blockchain will be the new FHIR, basically being a buzzword that folks don't know what to do with. Cybersecurity will be a hot topic at #HIMSS17 – and in my opinion, that’s really, really sad! What a waste of resources. So organizations should not invest in cybersecurity? ...trying to determine whether this is sarcasm... Find it sad #cybersecurity wasn't forefront on contracts & minds w/ #EHR adoption. Not what I mean. I'm saying it's money that in an ideal world really should not have to be spent - of course they will. Is cyber going to steal the light from blockchain magic so people are worried? Not sarcasm. IMO it's like "Y2k" - something that costs money just to stay even. I see. I agree. It's amazing how many things would cost less if humanity were honest. I am very interested in what government HC presentations will be like... who will be there. what will they say? #GovHIT conversations will be widely talked about. Future of ACA, health reform. I wouldn't believe everything you read "in the media" especially these days. How #publicsector can fight the #opioid epidemic with #healthIT See this. @potus & @realDonaldTrump using the trending #hitsm and #himss17 to market himself!!! It's a honour to help you to gain recognition sir! I think patient and employee engagement will be a hot topic, as well as the patient experience. Super excited about the #patientengagement models on the #himss17 session list this year! Finally the Patient voice is heard! Me too! Hopefully lots of REAL #PatientEngagement stories this year! Hi everyone! I think the invisible will stand out at #HIMSS17. Simple #patientengagement solutions that enhance & don't impede. I agree. It was flashy, but was it down thing everyday pts and providers can use today? It def has a future! Consumerism, ‘transparency,’ and value-based care seem like they're going to be 3 hot, inter-related topics at #HIMSS17. Monitoring social, the consumer conversation has been an emerging theme, per @RasuShrestha - See here. I'll be interested to hear discussions of "#healthcare access". "Access" is rapidly becoming a buzzword I zero in on. I'll take AI, MACRA, and Pop Health for 200 please Alex. Exhibitors is a hard one to predict. #MACRA continues to be a hot button issue. We've created a lot of content on the issue ourselves, but there's always more to see. Amen. #Medicaid block grants, #MACRA alternative payment models as commercial market may adopt/adapt them. Fate of #MeaningfulUse. Of course we think #telehealth will be a standout topic at #HIMSS17. I'm betting #telehealth solutions will have a huge presence, given block grant challenge & closing of rural hospitals. My plan for #HIMSS17? Friendships, connections & a wider network. What am I going to do with it? Just change the world. I hope to see advancements from the past few years. It’s still self serve (good start), but need to move to more systemic. Seriously waiting to see if any vendor foregoes booth excess in favor of mobile #health clinic w/ free #diabetes screenings. I like the idea of finding the invisible tech at #HIMSS17 Hard to do. Looking forward to the #HIMSS17 Interoperability Showcase. Important focus for the industry going forward. Want meaningful connections w/ orgs interested in solving real-world #healthcare problems, not just chasing shiny objects. Also excited for @MelSmithJones presentation on "Four Pillars of Social Media Governance"
Also on my #himss17 wish list: sessions that present successful integration of behavioral & physical health - w/ real data & results. Another great one: @LHCQF1's @CindyMunnCEO's session. Great case on ED reduction thru effective data use!